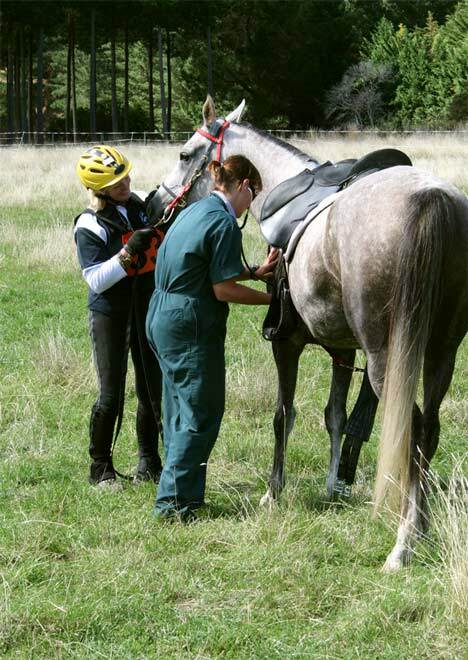 Vet checks are an important part of both endurance and competitive trail riding. Here, vet Mary Bowron checks the heart rate of Linda Harmon's horse MF Zanbuck. The pair were taking part in the Wakatū competitive trail event in 2009. In competitive trail rides, the horse's heart rate must return to 60 beats per minute or less within 30 minutes for a ride of fewer than 80 kilometres, and to 64 heartbeats per minute for any ride over 80 kilometres.